Reserve 1/2 cup Cool Whip; refrigerate until ready to use. Return remaining Cool Whip to freezer. Prepare cake batter as directed on package. 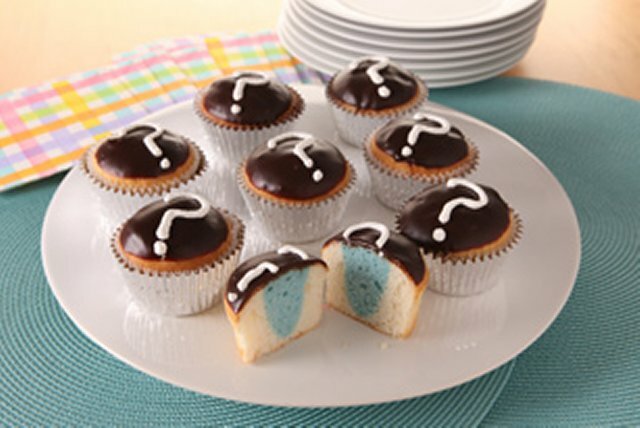 Remove 1 cup batter; tint with food colouring, using red for a baby girl or blue for a baby boy. Spoon 1 Tbsp. untinted batter into each of 24 paper-lined muffin cups; top each with 2 tsp. coloured batter. Cover with remaining untinted batter. Bake 21 to 24 min. or until toothpick inserted in centres comes out clean. Cool 10 min. ; remove to wire racks. Cool completely. Frost cupcakes before serving. Spoon reserved (thawed) Cool Whip into small resealable plastic bag. Snip off tiny piece from one bottom corner of bag; use to pipe Cool Whip into question marks on tops of cupcakes.